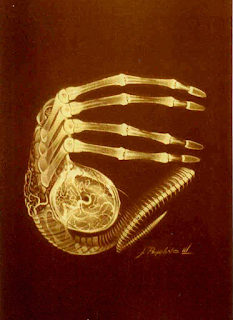 a) See: Facehugger drawing attributed to Ron Cobb? A big meeting took place, with Roger Dicken being told what the creature should look like and he had no idea what to make of it. Finally Ridley Scott pulled out Giger's Necronomicon as a guidebook and he pointed out various parts that he liked. Dan O'Bannon could see that Roger Dicken was very confused about the whole thing so he decided to ask Ridley if he could have a go at drawing the creature from the elements picked out. Ridley said "go ahead" and so Dan went over to the art department with Roger Dicken, they took a drafting table and a huge piece of paper with some pencils. He drew two heads on the paper and then opened Giger's book and put it down before them. He said "Ridley wanted part of this body, right?" and he sketched it out, he drew the fingers that Ridley liked and he added the tail as well. 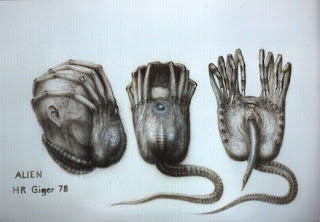 As they put together the concept, Giger came in, his plane had arrived from Switzerland and he had with him the designs for the facehugger that he had been working on and they so happened to be similar to the designs that Dan had sketched with Roger. Giger's version had an eye on the back, and looked more like the palm of a hand. Dan looked at Giger and said "Oh that's good!" but Giger looked at the designs on their designs on the drawing board and said "No, that's much better" which pleased Dan immensely. Dan asked "should I continue with it" and Giger replied "Oh yes", so the drawing that would replace Giger's concept went on. Dan O'Bannon with the design he was putting together realised that there was the need to create a skeletal understructure for the creature that it would need to hook the fingers onto, and Ron Cobb sketched some ideas that worked as a solution that Dan drew out. He drew everything in life size and they went with that. Dan O'Bannon considered the creature that they created as something eclectically constructed from what Ridley and Giger wanted with ideas from from Ron Cobb and Roger Dicken. Once they put it through the blueprint machine, Ridley okayed it and Roger went off to build it. 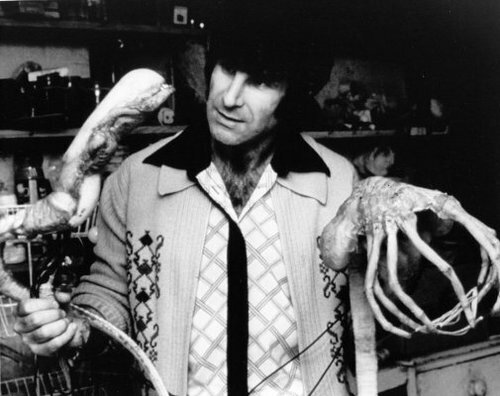 Roger Dicken was given a drawing which came up from the design department, which showed a head, with the face hugger in place and the tail wrapped around the neck. The tail was moved simply with a wire, so one could thrash it about or pull it tighter around John Hurt's throat. There were air bladders to make it breathe, and pistons which could move all the legs. Ridley wanted to fill the sacks on the side of the creature with slime, but he put it in the sacs and it clogged up the air tubes which made the sacs pulsate. They used surgical jelly on the hugger to get the slimy gooey effects . 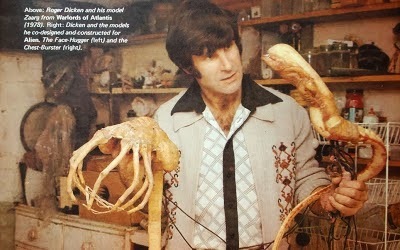 Roger did have his own concept for a facehugger that would have been different and more in keeping with his own aesthetics as a monster maker. He would have like to have made it a little more scaly and have little barbs like rose thorns on the leg and down the tail. Since this creature was self preserving, he felt that you shouldn't be able to get hold of the creature. He also felt that its skinny little fingers were far too delicate for something that had evolved such an extreme level of self-preservation and so would have like to have like there to have been barbed fingertips inside of smooth human type nails that they wanted. Starburst: What about the Facehugger which is the first alien we see after it has burst out of the egg and attached itself to Hurt's face? Roger Dicken: That was O'Bannon's design I think but as I say there were so many people on that film. I do know that O'Bannon drew something up and I built it. I would have liked it to have been a little more scaley and I would have liked to have little barbs like rose thorns on the legs and down the tail. As the alien was so self-preserving, you shouldn't be able to get a hold of the thing. I felt that in the film this wasn't well brought over. Roger Dicken : Well, I was down to that scene. Ridley was going to use some footage from the Oxford Experimental Film Unit of embryo chickens forming, showing blood filling the capillaries and so on, and superimpose it over the egg interior, but that wasn't used. I don't know what came out of the egg or who did it, it happens so fast. Cellulord: And the same process was applied to the Face Hugger? Roger Dicken: Exactly. That started life as a sketch which came up from the design department, I don’t know who did it. It basically showed a head, with the thing in place and the tail wrapped around the neck. Now, I thought those skinny little fingers were far too delicate for something that had evolved such an extreme level of self-preservation. I felt its fingers should have been spinier and thicker, but that was what they wanted, so, I went away and set-to, created the full-size model, and put my own detail on it. If you go here: http://www.propstore.com/product-Rare-Prototype-Face-Hugger.htm cycle through gallery you'll see two rare photos of the Facehugger prototype.